The Nerdy Side of Life: The NES Was, and Still is, the Best System Ever....Nuff' Said. 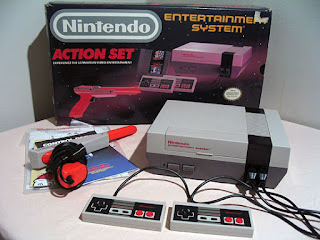 The NES Was, and Still is, the Best System Ever....Nuff' Said. The durability of the console, the controller and of course the games....boy were the games great. Say what you will about graphics, open world environments and online multiplayer, nothing beats games like Castlevania, the Legend of Zelda, Kid Icarus, Metroid and the list goes on and on. I didn't even mind the cartridges and having to blow in them when they weren't working properly...good times. Forget about the Move and Kinect, we had the Power Pad, The Power Glove and of course the Light Gun...motion gaming old school baby. My favorite all time console, followed closely by the Super NES...don't get me wrong, I loved my SNES but no system will ever come between me and my NES. If it was legal I would marry it and have a bunch of gits with it. I would even take it's last name, Michael John System. By the way...R.O.B. > Robocop...just saying.